As with all other rituals in life , namdhari sikhs observe the principle of simplicity in their marriages - the ANAND KARAJ. Satguru Ram Singh Ji preached liberty, equality and fraternity. Simplicity, sincerity, cleanliness and the innovation of God's name and his commandments. He taught his followers how to live simply and wear Swadeshi. " Simplicity all round was His motto ". From birth, namdhari silks believe in simple and clean living. They stress on non-violence and are strict vegetarians, non-smokers and tee-teetotalers. They keep away from the Four Deadly Sins ie Killing a Brahmin, Killing a cow, Killing one's daughter or giving away one's daughter for money and accepting food from a corrupt or immoral person. The Marriage ceremony is called 'Anand Karaj' and was first introduced in Sikhism by Satguru Ram Singh to free them from the Brahmin cal rites which were very expensive and cumbersome. ( They perform Anand Karaj - a ritual discovered by them conforming to the tradition of the House of the Gurus - Giani Gian Singh kabit 16 in panth parkash ). Satguru Ram Singh Ji introduced a system of mass marriages. Dowry, marriage procession and various other formalities associated with marriage were stopped. 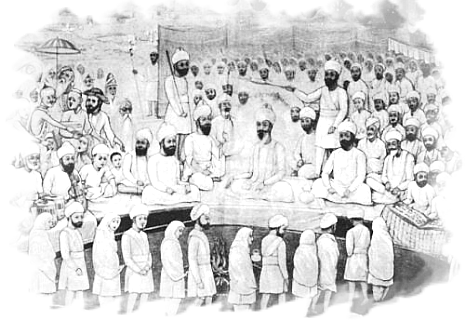 In June 1863, Satguru Ram Singh issued a special circular in which he prohibited the sale of daughters as well as infanticide. The circular, according to the official records said: "Whoever makes money by the marriage of his daughter is a rascal. Whoever commits infanticide is equally so." Even today mass marriages, 50 or more each time, are usually held on the end of some festivals and melas. The ritual for marriage ceremony, was first performed by Satguru Ram Singh in 1863. Simply put the couple is required to circumambulate four times around the sacred ceremonial fire (havan) along with recitation of hymns of "Lavan" from Sri Adi Granth Sahib. The first-ever inter-caste marriage was performed on June 3, 1863, in Khote village of Ferozepore in Punjab. The Anand form of marriage remained a dead-letter until Sri Satguru Ji advocated it. The first Marriage performed according to the Anand Marriage form was that of Bhai Samund Singh's daughter at Haripur (Khote). District Ferozpur. Eligibility for the marriage requires the couple be of suitable age, be able to recite the Ardas, no trimming of hair from any part of the body - eyebrows and beards may be thoroughly checked. Short comings in these may result in the delay of the marriage! Both families are prohibited from exchanging gifts, money etc. No pre-marriage ceremonies take place. A Havan Yag - a Ceremonial fire kept burning by pouring on it ghee and ,certain perfumes (the samghri) while priests recite banis (hymns) from the Adi and Dhasam Granths for evoking spiritual advancement, prosperity, purification of mind, environment etc., is performed before the actual marriage ceremonies. The Amrit (holy nectar) is prepared by adding patasas to sodh da pani while priests offer blessings by enchanting Gurbani (holy scriptures). Prashad - the sacred food made of floor, ghee (clarified butter) and sugar for offering to the Guru and distribution in the congregation is also prepared. All brides and grooms are dressed completely in white Sikh traditional clothes. 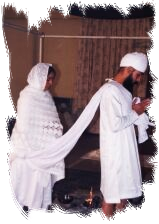 Initially the couple sit as regular members of the sangat (congregation). The ceremony starts when the bridegrooms gets up from the congregation and bows to Satguru Ji and sits (in rows during mass ceremony), on the white cloth spread on the ground around the ceremonial fire. The brides follow, who come and garland their husbands with a mala (woollen rosary), do namaskar to the bridegroom, and then sit on his left. During mass marriages the sons and daughters all Namdhari Sikhs sit side by side, and it is very difficult to find out the significant differences between the rich and poor. After this, couples are served with Amrit (Holy Nectar). Both candidates have to have the five 'Kakars' (5 K symbols) with him / her before the amrit is given. The bridegroom is in full 'Kamarkassa' (a white scarf is bound around the waist and shoulder and a small axe is tucked in the band). 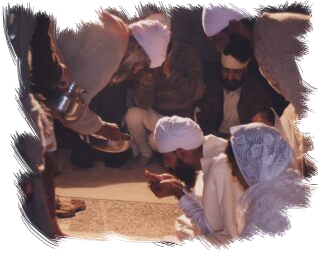 After cleansing their hands, drops of Amrit are poured into the cupped hands which they sip. This is repeated five times. After this some drops are sprinkled in their hair and eyes respectively, each five times. After each sip and application of the amrit the person receiving the amrit pronounce "waheguru ji ka khalsa waheguru ji ke fatee !". The symbolic ceremony of 'gandh chitrawa' (palla ceremony) is performed by tying a knot between the bride's and bridegroom's white scarves. This symbolises the union of the two souls for the rest of their lives. With their scarves tied together, the couple stand up and with the bridegroom leading they slowly circle the holy fire four times as the gurbani of lawan is recited from the Adi Granth Sahib. Encircling the holy fire symbolises that the couples are eye-witness to the Agni of their unity and vow that either shall not part till consumed by the fires of cremation ie till death. On completion of the lawan, the Anand Sahib gurbani is sung and path de bhogs are performed. In mass marriages these bhogs could number several hundreds to mark the conclusion of the Anand Karaj ritual. The couple will go straight to the bridedroom's home and to stay there for a minimum of 15 days thereby avoiding the muklawa and any other 'after' marriage ceremonies. The famlies are strictly forbidden from hosting any reception parties to mark the occasion and not allowed to accept gifts from relatives and friends. The bride goes to her new home with nothing but a simple white dress which she was wearing at her marriage ceremony. For a couple to get married on Namdharis' mass marriage ceremonies the cost is only the equivalent of one rupee and twenty five paise only! 'They (kukas) perform Anand Karaj - a ritual discovered by them conforming to the tradition of the House of the Gurus'- Giani Gian Singh kabit 16 in panth parkash. Sri Sat Guru Partap Singh Ji added further changes to be followed for Anand Karaj . ( Marriage Ceremony ). Anand Karaj should be performed without making any distinction between the rich and the poor. No sweets should be served in connection with Anand Karaj. On the occasion of Diwali of 8 th Nov. A.D. 1922, the Muklawa (farewell ceremony held by girl’s parents after marriage) was also banned. The engagements ceremonies were banned on Hollah Mallah festival on 22 March 1924 at Bijliwal. On the occasion of Baisakhi at Amritsar in 1926 A.D., it was announced that Namdharis should make marriage relations only within the Namdhari community since the girls faced difficulties when they were married in Non-Namdhari and Non-Vegetarian families. Performing Anand Karaj at home were banned on the occasion of Jap Prayog in 1935 A.D. at Sri Bhaini Sahib. The ceremony was to be held only at Namdhari dharamsalas. During the Hollah Mellah of 1937 A.D. at Sri Bhaini Sahib, it was ordered that henceforth marriage ceremonies would not be conducted without the prior permission of Sri Sat Guru Ji. The dowry of any form such as jewellery, bridal suits, furniture, cash, Shagun or any type of gifts etc. was also banned. In 1940 A.D. on the eve of Baisakhi at Amritsar, it was ordered that the couple should be given Naam before marriage.